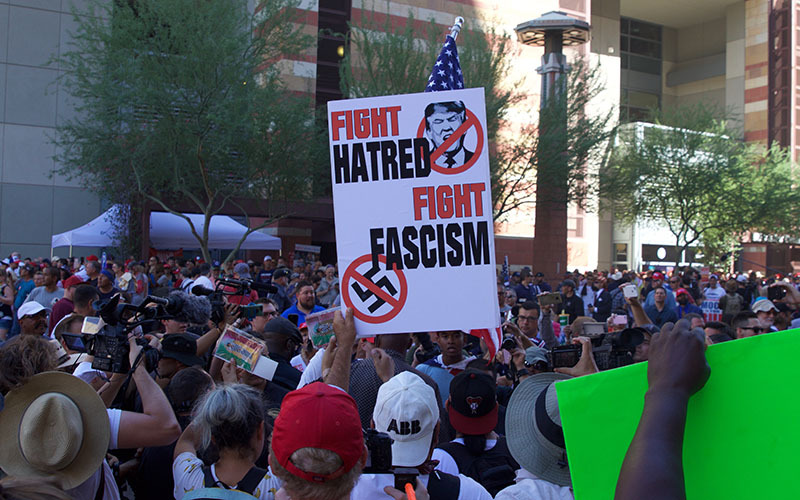 A sign reading “Fight Hatred Fight Fascism” is seen held above a crowd of counterprotesters in Phoenix. 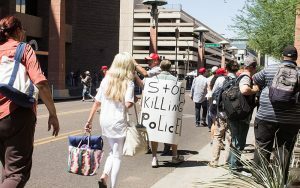 PHOENIX – Police deployed tear gas, concussion grenades and pepper balls to disperse the crowd near the Phoenix Convention Center as tensions rose following a campaign-style rally Tuesday night by President Donald Trump and counterprotesters. The crowd of several hundred protesters had been peaceful during the day and as the rally progressed inside the convention center. But once it ended, some protesters wearing face masks began to throw rocks at Phoenix police, who were in riot gear. The police fired several canisters and concussion grenades. The majority of protesters dispersed quickly, but a crowd remained for more than an hour. At about 9 p.m., police moved in a line to push the remaining protesters away from the convention center. 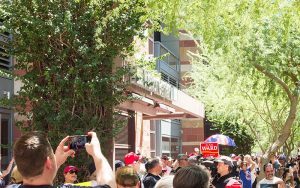 The conflict was a tense end to a long, hot day with Trump supporters lining up outside the convention center early in the morning, draped in American flags, wearing “Make America great again” hats and sporting Trump T-shirts. Local authorities and some businesses prepared for any scenario by closing streets and closing hours early. 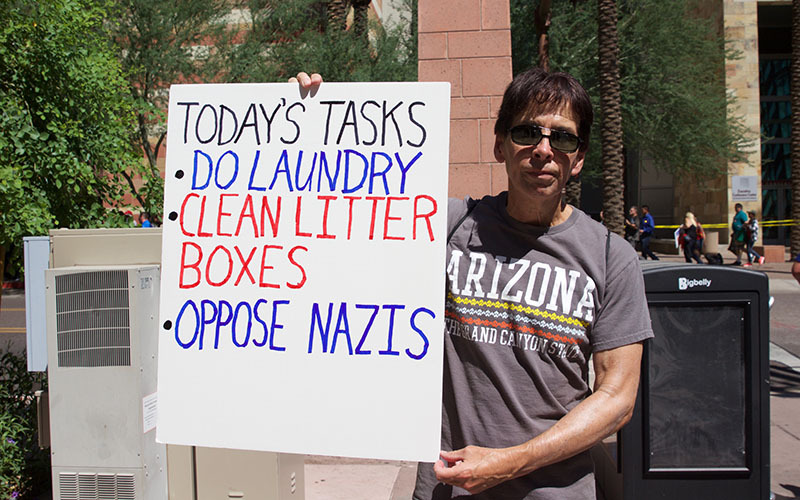 The first protesters arrived at the scene a few minutes after 1 p.m. Two women from Tucson held a sign that said “Nazis will not replace US.” Maryland Brier, a teacher from Los Angeles wearing a “Make America Great Again” cap watched from a few feet away with a smile. By 3 p.m., additional police arrived at the scene as more protesters began to gather. Despite a relatively peaceful afternoon, there was some back and forth between supporters and protesters. One Trump supporter said “liberal here” when talking with one man. Another man shouted across the street from the line. When a Trump supporter offered the protester a soda, the protester answered with an expletive. Mike Tucker, the Trump supporter who offered the soda, later shouted, “I’d like to have a conversation with you” but was ignored. Tucker, 48, said in an interview he believed there is a misunderstanding about the president. As more protesters with signs arrived, Trump supporters chanted against them. 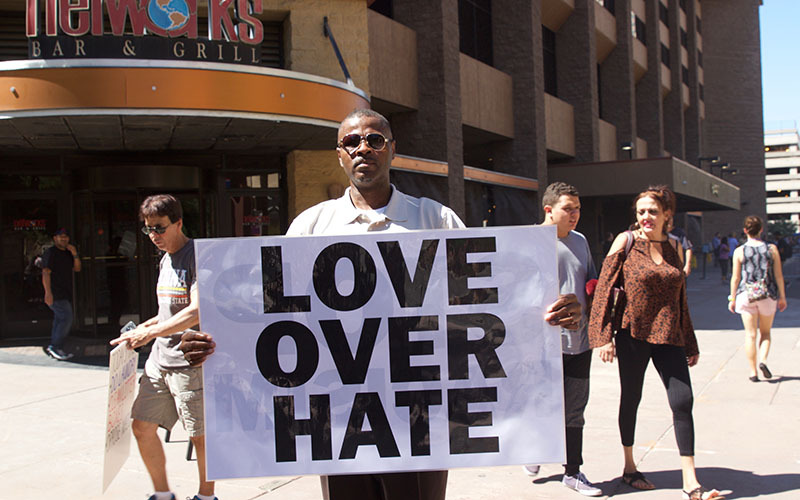 Kenneth Perkins, 49, was booed by Trump supporters as he walked in front of them holding a sign that said “Stop Racism” on one side and “Love Over Hate” on the other. “I don’t want today to happen like what happened at Charlottesville,” Perkins said. Lance Motta-Vilensky, another protester, praised him. 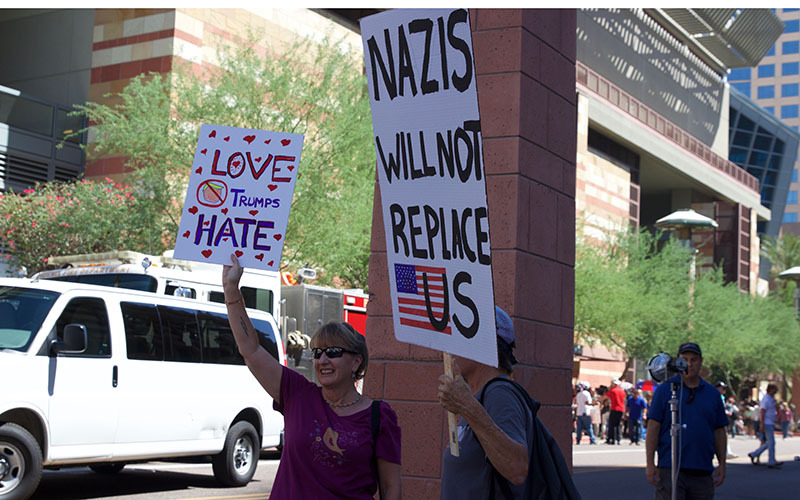 City prepares, reacts to Trump’s rally in downtown Phoenix. Phoenix officials said they expected several thousand protesters and supporters. There was heightened concern with news that Trump was “seriously” considering a pardon for former Maricopa County Sheriff Joe Arpaio, who was convicted in July of contempt of court for defying a court order to stop using racial profiling. Trump had said he would consider a pardon for Arpaio, one of the president’s earliest and most vocal supporters. U.S. Rep. Raul Grijalva, D-Arizona, on Tuesday said a pardon will “deepen the divisions that are already deep enough in the country.” Grijalva joined community groups to denounce Tuesday’s rally. “It would absolutely be a miscarriage of justice,” said Laila Ikram of the Council on American and Islamic Relations. 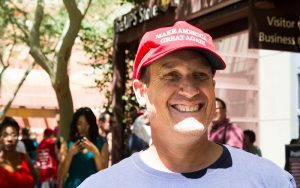 But if Trump does issue a pardon, Ikram said the groups would continue peaceful protests and encourage Arizona residents to register to vote. The community groups also voiced their concerns about Trump’s reaction to the events in Charlottesville, where one woman was killed and others were injured during counter demonstrations of a white supremacist march. “He’s insulting our community,” said Eduardo Sainz, deputy director of Mi Familia Vota’s Arizona chapter. The other groups at the news conference included Living United for Change Arizona, Arizona League of Conservation Voters, Planned Parenthood of Arizona and the Arizona Coalition for Change.